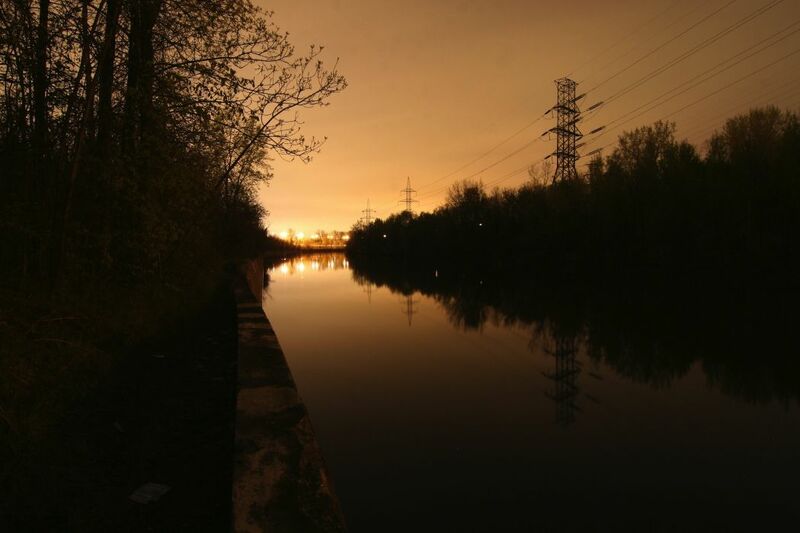 Montreal's former aqueduc canal at night. 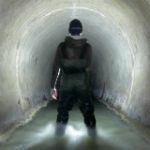 So far, most of my entries have dealt with Montreal’s sewers as its the one aspect of the underground that I’ve spent the most time exploring. During my time looking into that particular system it’s been hard to avoid the city’s waterworks, both during my time traveling around (and under) and at the City Archives. While the two systems serve entirely different purposes, they still share a few things in common and often intersect in a number of different ways. While one can’t exactly travel through the waterworks system to the same extent that you can the sewers, there are still a number of different components that can be peered into and occasionally entered. But before we do that, a little bit of history. The roots of both networks can be traced back to the 1800s. 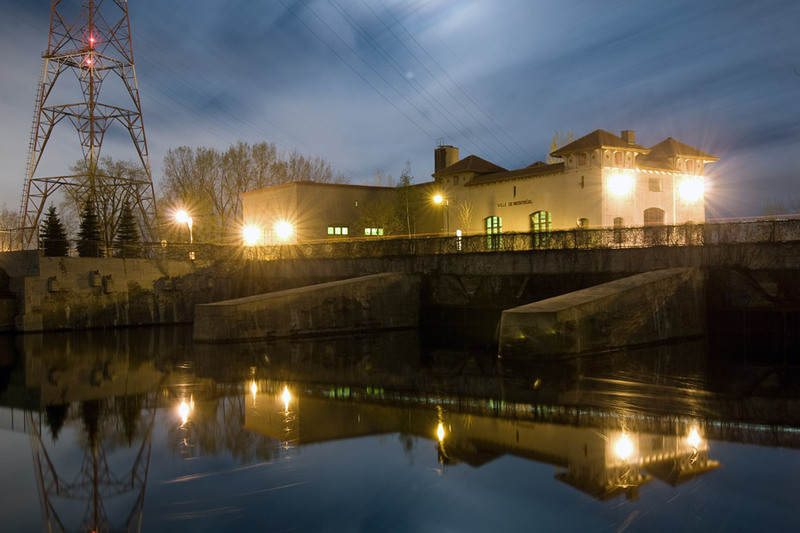 The waterworks was established during the early 1800s and in turn encouraged the growth of the sewer system. As the water distribution network expanded, sewers became necessary in order to help get rid of it once consumed. Public records also illustrate how the expansion of the sewer system might have inadvertently helped distribute water into areas that were previously dependent on wells. There are also reports of water pipes having been laid directly along the interiors of the sewers – a practice likely inspired by Paris – but I’ve yet to see such a thing in person. For the most part, the two systems generally stay out of each others way and for obvious reasons. In regards to subjects already covered on this site, both systems also made use of Riviere St. Pierre, but for different purposes. 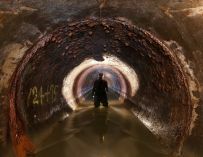 The city’s first collector sewer relied on the river’s flow to take wastewater away from the city and out into the harbour. Likewise, the City’s first successful waterworks system used the Verdun arm of the river to dispose of the water passing through its system’s wheelhouse. A tailrace channel leading south to the St. Lawrence was later added as a substitute for the river. This passage can still be detected today by the straight stretch of Autoroute 15 that defines the west border of Verdun. Buried beneath this tract of land is the St. Pierre Collector sewer, which, much like the tailrace that preceded it, is used today to discharge excess water from the present day filtration plant. Attempting to explain the history of the entire waterworks system would probably be a bit too much for one post so like I’ve been doing with Riviere St. Pierre, I’ll try and break things down into several posts starting with the aqueduct. The Montreal aqueduct (or aqueduc, in French) is an open canal that runs a length of roughly 8 kms from LaSalle to Verdun. It’s hard to miss, but it’s also quite easy to forget about and take for granted. Unlike the nearby Lachine Canal, the aqueduct doesn’t have an abundance of picturesque buildings situated alongside it. It has its charms, but more often than not it seems to be more of an obstacle than an attraction. A bike path running along the canal’s south side was added during the 1980s, but the aqueduct itself is fenced off, for security reasons and to discourage people from using it for recreational purposes. For anyone following the news in Montreal lately, this public use VS water security aspect might sound familiar. Of course, it’s never too difficult to find an opening to be able to walk along its shore where you’ll often encounter people fishing. The City of Montreal completed the aqueduct canal in 1856 under the direction of Thomas Keefer. It was designed to bring the “purest” water from the St. Lawrence River to a point where it could then be pumped up towards the central region of Montreal. At the time of its completion, there had already been fifty years worth of attempts by private companies to distribute water to various points across the city. All had failed for a number of different reasons. The first effort began during the early 1800s. Using a system of wooden pipes, water from a creek (or “spring”) in Cote Des Neiges was transferred around the West side of Mount Royal and into two reservoirs situated in Montreal. Given the small amount of water available from the source, it comes as no surprise that the scheme never quite worked out. With a rapidly expanding population during the middle of the 1800s, a series of devastating fires, and the spread of industrialization, it was clear that a more comprehensive scheme to distribute water across the city was necessary. 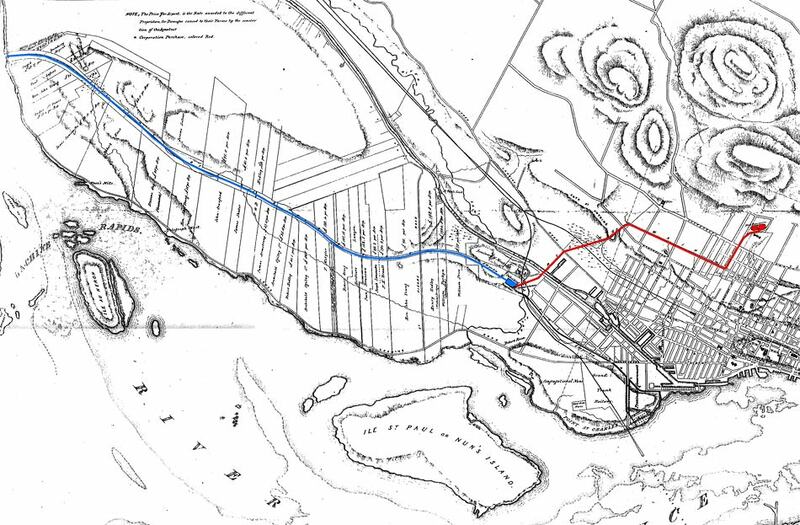 The solution, as proposed by the city’s Chief Engineer Thomas C. Keefer in 1852, involved the aqueduct canal to convey what was found to be the most reliable and “pure” source of water from the St. Lawrence River. The Lachine Canal was briefly considered as a source of water, but later rejected. One of the reasons was that it was thought its polluted water might be hazardous, not so much for people, but for the iron pipes to be used throughout the distribution system. 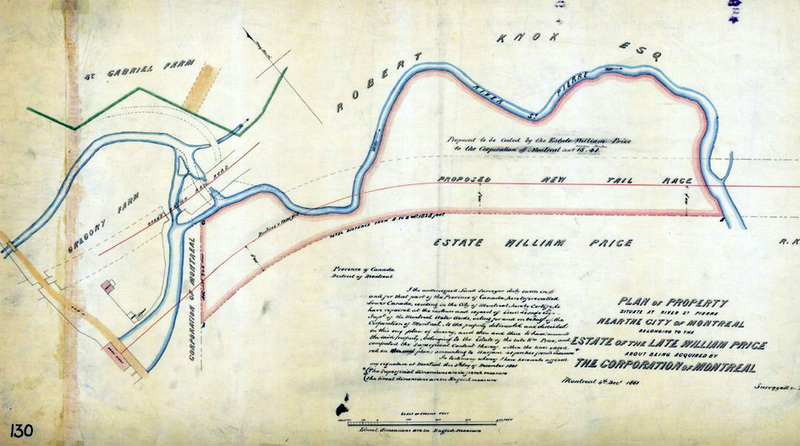 Plan of the aqueduct system in 1854 showing the path of the rising mains (red) which delivered water to the McTavish reservoir. This map also shows the proposed path of a tailrace channel exiting South of the entrance to the Lachine canal. The entrance point of the aqueduct was first located at point further East. Today, the broad curve at the Lasalle end of Rue Champlain is attributable to the canal’s original path. 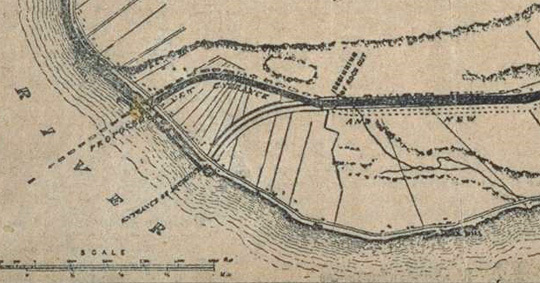 1911 map showing the old and new entrance points to the aqueduct. The bottom entrance was later filled in during the 1920s. At both entrances, gates designed to regulate the flow of water and to keep ice and other debris from entering the entrance to the aqueduct. Overlooking the Lasalle end of the aqueduct in Lasalle built during the 1920s. The building in the background was constructed at the same time and currently transfers water from the river to the Charles J. Desbaillets treatment station. After water entered the aqueduct it was fed by gravity towards a single settling basin 4kms away which encouraged rock and other solids to fall to the bottom. This was the extent of purification at the time. Adjacent to the settling basin sat the wheelhouse containing water wheels which powered a pumping station used to force the water uphill through a series of underground iron pipes towards the McTavish reservoir- a good four kilometers away. 1913 map overlay of the Atwater treatment plant property. By the 1920s, everything on the property had been either decommissioned or demolished and replaced with a newer purification plant that could be operated using electricity. It also abandoned the settling basin in favour of a series of filtration galleries. This same arrangement is what can be found on the property adjacent to the end of the aqueduct today, albeit with a few upgrades that have since been added. As for the aqueduct itself, not much has changed since its conception. It’s both wider and deeper than the original, having been altered over the years to meet changing needs. For the most part, its alterations were made in order to increase the horsepower available to hydraulic (and steam) equipment. Given that the current system is now powered by electricity it is likely far larger than it needs to be. Despite these ambitions, the aqueduct found today is still only used to help transfer potable water using the same principles that were established in its infancy. The methods of purification have changed, and many of the system’s components have been upgraded over time, but the methods used to get water from the St. Lawrence River to downtown Montreal have remained more or less the same. Fascinating. Very well written and well documented. Can you imagine if they actually decided to pick out the Lachine canal as the main source?? Heh, well they actually did end up running a pipe across from the canal over to the station so that it could be used as an “emergency supply.” I think they put that in around 1910 or so. I have no idea if they ever had to use it. Let’s hope not.. When i was young we used to hang around that big building at the Lasalle end of the aqueduct and one day a worker came and he let us in to visit. I tought that was very cool. We would also swim under the bridge where you can see and feel the water rushing up from somewhere under.